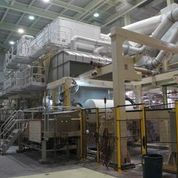 White Mountain Tissue, LLC began as a joint venture between Gorham Paper and Old Town Fuel & Fiber, and launched with an invested $35 million to install a state-of-the-art crescent former tissue machine. With a production capacity of 36,000 tons a year, it is one of North America’s only independent parent roll tissue suppliers. Target markets include bath, towel and napkin for at-home, retail, and select away-from-home applications. For parent roll sales, please contact our sales and marketing partner Central National-Gottesman. 50 years of innovation later…. New tissue machine start up in 2012. 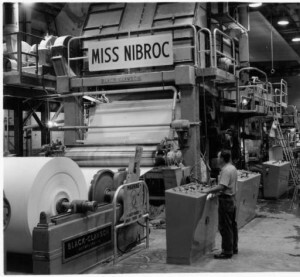 Previous tissue machine (1962 photo).